French authorities have zeroed in on two men they believe were responsible for planning and launching the terrorist attacks in Paris that left at least 129 people dead. Citing two sources close to the investigation in Paris, NPR&apos;s Dina Temple-Raston reports that officials believe Salim Benghalem, a French national who joined ISIS several years ago, directed Abdelhamid Abaaoud, an ISIS deputy and a Belgian national, to orchestrate Friday&apos;s rampage. The two men are believed to be in Syria. Using automatic weapons and explosive devices on Friday, three well-organized teams of assailants targeted six sites across Paris, including the national stadium, a crowded concert hall and several restaurants. The Islamic State took responsibility for the attack and in a speech before both houses of Parliament, French President François Hollande said that France "was at war." The attacks in Paris, he said, represent "an aggression against our country, against our values, against its youth and its way of life." France, he said, will seek a United Nations resolution to fight terrorism and it will move an aircraft carrier to the Middle East as part of an effort to intensify its bombing campaign in Syria. This morning, French Interior Minister Bernard Cazeneuve said the country has conducted 168 raids, detaining 23 suspects and putting more than 100 under house arrest. "It&apos;s just a start," Cazeneuve said. "These operations are going to continue. The response of the Republic will be huge, will be total." Paris prosecutor François Molins said that five out of seven of the dead terrorists have been identified, but police are still on the hunt for an eighth suspect named as 26-year-old Salah Abdeslam. We&apos;ll update this post throughout the day, so make sure to refresh the page for the latest. In a show of solidarity with the French, Secretary of State John Kerry has arrived in Paris. Kerry is scheduled to meet with French officials as well as embassy staff. "He will reiterate America&apos;s commitment to our strong relationship with France and express our condolences as well as our shared resolve to continue countering violent extremism here and around the world," State Department Spokesperson John Kirby said. Republican governors in seven states are saying they won&apos;t take Syrian refugees being resettled in the United States into their states. In a letter to President Obama, Texas Gov. Greg Abbott asked that the president halt plans to accept more Syrian refugees. "A Syrian &apos;refugee&apos; appears to have been part of the Paris terror attack," Abbott wrote. "American humanitarian compassion could be exploited to expose Americans to similar deadly danger." Governors from Indiana, Michigan, Mississippi, Alabama, Louisiana and Florida have made similar decisions. It&apos;s unclear whether the governors have the legal authority to exclude refugees from their states. NPR&apos;s Brian Naylor reports that a Department of Homeland Security official tells him that "refugees are subject to the highest level of security checks of any category of traveler to the United States." The administration, the official said, is "steadfastly committed to the President&apos;s plan to resettle at least 10,000 Syrian refugees" in fiscal year 2016. The Eiffel Tower in Paris has been dark — and closed — for the past few days. Today, however, as more Parisians took to the streets, the tower opened again to tourists and it came back to life — lit up with the colors of the French flag. That phrase — fluctuat nec mergitur — translates from Latin as "tossed but not sunk." Earlier today Islamic State militants released a video that threatened an attack on the United States. "We say to the states that take part in the crusader campaign that, by God, you will have a day, God willing, like France&apos;s and by God, as we struck France in the center of its abode in Paris, then we swear that we will strike America at its center in Washington,"one militant says. Citing an American law enforcement source, NPR&apos;s Carrie Johnson reports that the U.S. has no specific intelligence to back up those threats. "U.S. authorities continue to say there is no specific or credible information about attacks here," Carrie tells us. "That said, FBI and local and state law enforcement partners have been directed to pay &apos;special attention&apos; to priority cases here in the U.S. – that could mean increasing electronic and physical surveillance, for instance." Boulevard Sait-Germain, usually bustling with cars and pedestrians, was eerily quiet. A building at Sciences Po University was evacuated because of a suspicious package. It turned out to be nothing. Some Students out front said they thought everyone was overly nervous. But at the same time they understood. Many Parisians expressed the need to be out and about. "We can&apos;t stop our lives," they said. After Hollande finished his speech to a joint session of Parliament, French politicians sang La Marseillaise, the French national anthem. Hollande asked his parliament take up a series of issues including, amending the constitution and extending France&apos;s state of emergency from 14 days to 3 months. — He would seek a resolution from the United Nations to fight terrorism. — He would invoke a provision of the European Union that provides backup when a member-nation is attacked. — He would move an aircraft carrier from France to the Middle East. — He would intensify France&apos;s bombing campaign in Syria. — He would consult with the United States and Russia to "fight against ISIS within the framework of a coalition." — The U.N. Climate Change Conference scheduled for Paris at the end of the month will go as planned in what Hollande said would be a "moment of hope and solidarity." Hollande closed by saying: "Terrorism will not destroy the Republic, because it is the Republic that will destroy terrorism. Long live the Republic; long live France." "France is at war," French President François Hollande told a joint meeting of Parliament. The attacks in Paris, he said, represent "an aggression against our country, against our values, against its youth and its way of life." Hollande said that he would seek a United Nations resolution to "fight against terrorism." "Meanwhile, France will intensify its military operations in Syria," Hollande said. He added that he will ask Parliament to extend the country&apos;s state of emergency for three months. The French president is still speaking. We have posted a live stream of Obama&apos;s press conference and Hollande&apos;s speech to his Parliament here. During a press conference in Turkey, President Obama called the Islamic State, "the face of evil." Obama also defended his strategy against the Islamic State. There is no use in invading Syria, he said, because for that to work, the U.S. would have to be willing to occupy it permanently. "There will be intensification of the strategy that we put forward," Obama said. "The strategy that we are putting forward is the strategy that will ultimately work... but as I said in the beginning, it is going to take time." Obama described the strategy against ISIS as one that goes after targets and leadership in Syria and one that strengthens Syrian and Iraqi forces that "are prepared to fight" ISIS. We have posted a live stream of Obama&apos;s press conference and Hollande&apos;s speech to his Parliament here. "According to two sources close to the investigation, Salim Benghalem, 35, is considered the supervisor for French would-be jihadists who travel to Syria to live and train with the group. He is the most high profile Frenchman with ISIS and considered the &apos;Jihadi John&apos; of France. He grew up in Paris suburb of Cachan." In an address Monday morning in Washington at the Center for Strategic and International Studies, CIA Director John Brennan directly addressed the Paris attacks. Among other things, CIA Director Brennan said the attacks seem "to have been carefully and deliberately planned" over a period of months. Brennan said the attacks were "not a surprise." "We did have strategic warning" but apparently no specific or operational details, Brennan added. He said the plot bears "the hallmarks" of ISIS and that there has been a "significant increase in operational security" by the Islamic State. Jihadis "have gone to school on what they need to do" to evade detection by Western intel services, once again raising the specter of encryption. 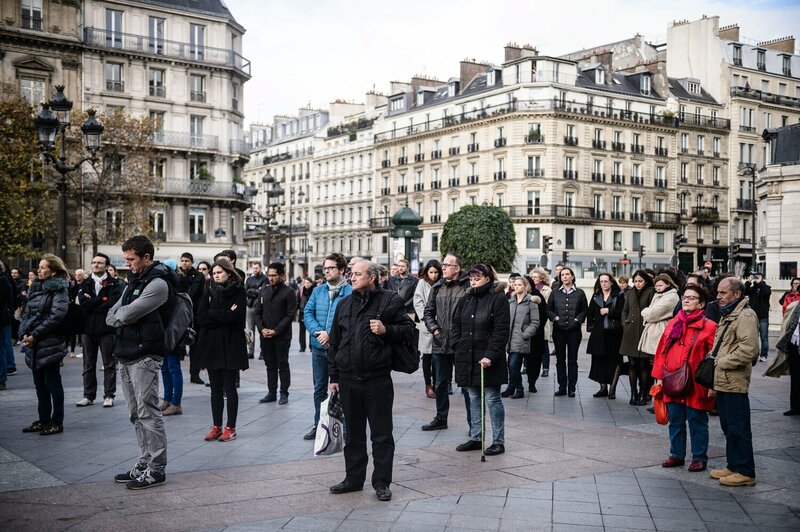 Earlier this morning, France observed a minute of silence to honor the victims of one of the country&apos;s deadliest terrorist attacks. French President François Hollande and his cabinet observed the moment at Sorbonne University in Paris. It ended with the crowd gathered there singing La Marseillaise, the French national anthem. Reporting from Belgium, NPR&apos;s Peter Kenyon says that there is a big police operation happening in the Molenbeek neighborhood of Brussels. It&apos;s unclear what is happening, but it appears that police may be closing in on the eighth suspect. The public broadcaster in Belgium, RTBF, reported that one person has been arrested. Two big things to look forward to this morning: French President François Hollande will speak to a joint session of Parliament at 10 a.m. ET. President Obama will have a press conference at 10:30 a.m. ET. He&apos;ll be speaking from Turkey, where he has been at a meeting of the G20. We&apos;ll, of course, blog that but we&apos;ll also make sure to post a live stream. — Ismael Omar Mostefai, 29, who attacked music fans at the Bataclan and then blew himself up using a suicide vest. — Samy Amimour, 28, was another of the suicide bombers at the music venue. — Ahmad Al Mohammad, 25, died after detonating a suicide bomb outside the soccer stadium. His name was on a Syrian passport found alongside his body. The Paris prosecutor Molins said in a statement that while the authenticity of the passport has been questioned, a man with Mohammad&apos;s fingerprints match those of a man who used the same passport to enter Greece in October. Molins said that passport check in Greece is part of a requirement that all asylum seekers register at their first point of entry in the European Union. — Brahim Abdeslam, 31, died when he denotated a suicide vest on Boulevard Voltaire. A French national living in Belgium, he is the brother of fugitive suspect Salah Abdeslam.